Imam Zaid Shakir (born Ricky Daryl Mitchell) is an American Muslim scholar who has taught courses in Arabic, Islamic spirituality, contemporary Muslim thought, and Fiqh at Zaytuna College. He presently teaches Islamic history and politics. He speaks and writes on a wide range of topics and has become a voice of conscience for American Muslims as well as people of other faiths. He is regularly included as one of the Western world’s most influential Muslim scholars in The Muslim 500, an annual ranking edited by John Esposito and Ibrahim Kalin. He is also one of the signatories of "A Common Word Between Us and You," an open letter by Islamic scholars to Christian leaders that calls for peace and mutual understanding. He holds an M.A. in Political Science from Rutgers University. He is one of three co-founders of Zaytuna College and serves on its Board of Trustees. We are extremely pleased to have Imam Zaid Shakir come from California and to deliver the keynote address. The event is scheduled to promptly start at 7pm on Saturday, March 30, 2019, inside the new Masjid at 837 N. Indian Creek Drive in Clarkston, GA. 30021. All are welcome free of charge! Please share with friends and family! We look forward to seeing you then, in Sha' Allah. 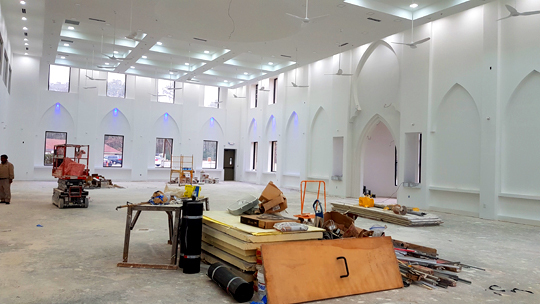 Click here to see a YouTube video depicting inside views of the new Masjid. Allah-u-Akbar! Call 678.462.4442 for a personal tour of the New Masjid with your friends and family.